On Oct. 2, 2013, Gene N. Peterson, M.D., Ph.D., became VCU Medical Center’s first chief safety and quality officer and the VCU School of Medicine’s associate dean for patient safety and quality care. As an integral part of the leadership team, he is charged with taking the medical center to new levels of safety, quality, graduate medical education and curriculum design that crosses all clinical disciplines. A practicing anesthesiologist, he also serves as an attending physician on the anesthesia team. Peterson, who previously served as associate medical director and co-director of the Center for Clinical Excellence at the University of Washington Medical Center, said part of what attracted him to his new position was the commitment of the VCU Medical Center leadership team to become the safest health care system in the nation. As someone who collaborated on the World Health Organization surgical safety checklist with E. Patchen Dellinger, M.D., for 10 years, Peterson values standardized communication and safety checklists. His to-do items include three goals he hopes to implement within the next two years. The first empowers all members of the organization to speak up if they see something wrong or sense a potential problem. “If you see something, say something,” Peterson said. The second revolves around the standardization of transitions of care, or patient handoffs. Every day at the medical center, hundreds of handoffs occur between shifts. Peterson wants to ensure that faculty and residents have the necessary tools and skills to perform the process well. – Gene N. Peterson, M.D., Ph.D. The final goal refers to STAR Service, in which all VCU Medical Center staff and residents take part. STAR Service isn’t a program but rather a culture founded on “Safety First, Every Day” and supported by the medical center’s commitment to provide patients, visitors and fellow team members with superior service. 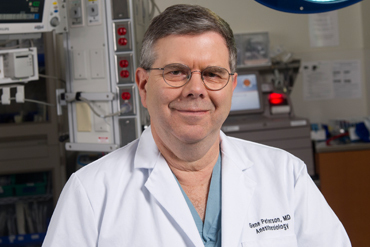 Meet Gene Peterson, M.D., Ph.D.